Fly Buys remains New Zealand’s largest reward-loyalty programme. Consumers also rank it the best. A Horizon Research survey of adult shoppers nationwide finds 73% belong to Fly Buys. Across three Loyalty Scheme Effectiveness surveys in August 2016, January 2017 and August 2017, Fly Buys is up from 67% in January, yet still slightly lower than 77% in August 2016. Countdown’s Onecard continues to have the second largest membership with similar results across all three measures (60% in August 2017, 62% in January 2017 and 61% in August 2016). The AA Smartfuel Programme similarly remains in third position with 58%, increasing from 51% in January 2017 and 49% in August 2016. New World’s Club Card membership has shown slight increase from 41% in January 2017 to 45% August 2017 and remains the fourth largest. It shares fourth with Air NZ Airpoints which moves up from sixth (significantly up from 27% in January 2017 and 34% in August 2016 to 45% in August 2017). After its significant decrease from 42% in August 2016 to 31% in January 2017, Farmers increases to 39% in August 2017, although still remaining in fifth position due to the significant increase in membership by Air NZ Airpoints. On average, consumers belong to 4.2 reward/loyalty programmes, increasing from 3.6 in January 2017 and 3.1 in August 2016. Fly Buys moved back from second to first position with 24%, making it the best rated reward/loyalty programme in the market once again (21% in January 2017 and 29% in August 2016) and in doing so moving AA Smartfuel from first to second position (21%, from 27% in January 2017 and 14% in August 2016). Countdown’s Onecard remains in third position (9%, from 10% in January 2017 and 9% in August 2016) although joint with Air NZ Airpoints (9%, from 8% in January 2017 and 9% in August 2016). Due to Countdown’s Onecard and Air NZ Airpoints in joint third position, New World’s Club Card has moved from fifth to fourth position with 4% (previously 7% in January 2017), while Farmers Club has similarly moved from sixth to fifth position, with only 2% of consumers rating it as the best reward/loyalty programme in the market (2% in January 2017 and 5% in August 2016). The following chart indicates how reward programme members rate each of the programmes in August 2017. It is still evident that even though individuals may be a member of one of these reward/loyalty programmes, it does not necessarily mean they regard it as the best one available. 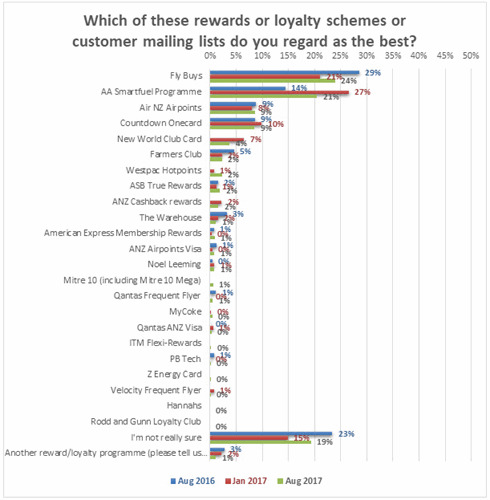 The chart below shows that 26% of Fly Buys members think Fly Buys is the best scheme, but so do 21% of Countdown Onecard members, 19% of Air New Zealand Airpoints members, 24% of New World Club Card members and 19% of Farmers Club members. The members of Countdown Onecard, Air New Zealand Airpoints, New World Club Card and Farmers Club all rate Fly Buys as better than their scheme. However, also note that only 26% of Fly Buys members think Fly Buys is best. 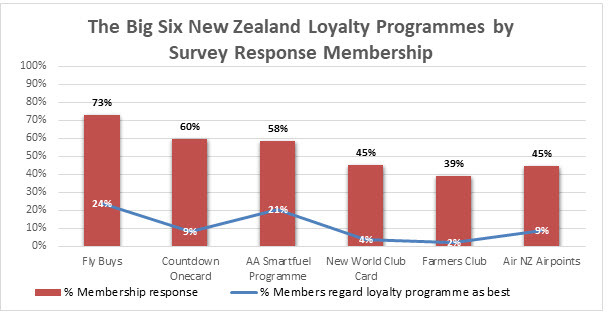 23% of Fly Buys members think AA Smartfuel is best, 7% think Countdown Onecard is best, 7% think Air New Zealand Airpoints is best and 14% aren’t sure which scheme is best. Even though millions of New Zealanders belong to loyalty schemes, the latest Horizon survey finds only 3% feel retailers definitely know what they want, when and for what prices. Horizon Research surveyed 1,272 adult consumers nationwide between 11 and 16 August 2017 about retailer and loyalty programmes. The survey has a maximum margin of error overall of +/- 2.8%. You are welcome to comment at our Facebook page. For further information please contact Grant McInman, Manager, Horizon Research, e-mail gmcinman@horizoresearch.co.nz, telephone +64 21 0762040.